Sangley (Sangleye, Sangley Mestizo, Mestisong Sangley, Mestizo de Sangley or Chinese mestizo; plural: Sangleys or Sangleyes), is an archaic term used in the Philippines to describe and classify a person of pure Chinese ancestry, while mestizo de sangley was used to refer to a person of mixed Chinese and Malayo-Polynesian ancestry. (The latter were referred to as Indio during the Spanish Colonial Period.) Sangley mestizo was a term widely used in the 16th to 19th-century Spanish Philippines to differentiate ethnic Chinese from other types of island mestizos (such as those of mixed Indio and Spanish ancestry.) The Chinese mestizos were granted the legal status of colonial subjects of Spain, with certain rights and privileges denied both the pure-blooded Chinese immigrants (sangleys) and indigenous persons (indios). Today, Tsinito (literally, "little Chinese man", in Spanish, Chinito) is widely used to describe a Sangley, but it is also commonly applied to Filipinos of other East Asian ancestries (Japanese, Korean, etc.) who possess similar physical features. Tsinoy or Chinese Filipino, on the other hand, is used to refer to Filipinos specifically of Chinese descent, regardless of cultural orientation or racial pedigree. Among Chinese-Filipino mestizos, many use and prefer the generic term mestizo to describe themselves. Sangley comes from the Hokkien Chinese word seng-di (traditional Chinese:生意; POJ: seng-lí), meaning "business". Although mestizo de sangley literally means "mixed-race (person) of business", its implicit meaning is "mixed-race (person) of Chinese descent". The closest etymological relation is the Spanish term: "mestizo de sangre", which literally means "of mixed blood". By default, mestizo without the qualifying de sangley means a "mixed-race (person) of Spanish/European and indio ancestry". But, due to the relatively few español mestizos in the Philippines, as commonly used, mestizo refers to mestizo de sangley. This was explained by W. E. Retana in testimony before the United States Philippine Commission (1899-1900) and in his Diccionario de filipinismos (1921). The term chino mestizo was also used interchangeably with mestizo de sangley. "People have been commenting on the profile photo of the woman with a fan. I first found this photo at the Musee De L'Homme in Paris in 1985. The picture is only identified as Sangley Filipina meaning Chinese Filipina. As a photo historian and... collector I have dated this photograph around 1870's and the photographer is Francisco Van Kamp. He was a European that had a photo studio in Manila. The photograph is unusual because the woman exhibits a subtle and alluring look in start contrast to photos of women, mostly modest looking of that period. Her hair glistens with coconut oil and her fan, half open means she is single. I have shared that photograph since to others and there have been findings of the same photo in other repositories. But I am pleased to have found it myself since the photo was actually misplaced in the French museum. They had put this picture under Tahiti! I made sure it was back in the Philippine folder!" Actually, if you look through the original church records throughout the islands, you will find there were many mestizo espanol/mestiza espanola. In the Spanish era, no one was ever described officially as simply mestizo. The term mestizo was always qualified as it made a difference to a person's legal/tax standing in the country. Perhaps it was when the United States occupied the islands (since they really didn't understand why these terms existed)that these terms became less specific. 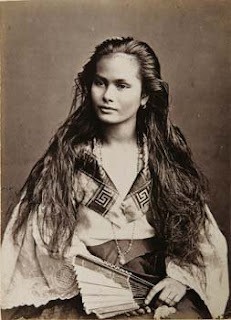 Since i saw this beautiful photo of a filipina women i was wondered who is she?